Tamansari, Yogyakarta. Tamansari was a part of heritage building of Sultan Palace. Tamansari means "beautiful garden". Tamansari, Yogyakarta was first established in 1758 and is the first idea of Prince Mangkubumi (later titled Hamengkubuwono I) and also Raden Ronggo Prawirosentiko (Madiun) as the architect, and Demang Tegis (Portuguese native who graduated from the kingdom) as structure experts. Tamansari, Yogyakarta is not only a recreational park which became the royal family of that era, but also has a variety of functions which are also used as an area Camouflage against his enemies, and also became a bastion of the system, but it is also used as a place for meditation for the Kings, a place to make batik made ​​by the king's concubines and daughters of the King, a place for the royal army military training and much more. Castle then widely referred to as the Water Palace (water castle) that because of the value and uniqueness of the architecture of the building and the grooves are filled with pond water pond. Role in history is conveyed by some people who become your Water Castle mentions that the park is used by the king of Mataram (Yogyakarta) to take a bath in certain months. There is little mysticism going on around the pool area at the time. When the King was about to enter the Water Castle then greeted with gamelan music sung from small buildings on the right and left in front of the Water Castle. Then there are certain ceremonies to welcome the King and the people who want to get into the Water Castle. There is the sacred place in the complex showing a separated building, which once functioned as a hermitage place for the Sultan and his family. This part was formerly a pleasure place for the royal family. Consists of two bathing pool that are separated with a 2-storey building. From this building the Sultan watched all the women swimming in the outer pool. Then he might ask some of them to accompany him into the inner pool. The water sprouts from a forming animal statue into the pool. The pool is also adorned with some big flowerpots. This part compounds of some buildings such as Kenanga or Cemeti Island (forming Island), Sumur Gemuling and underground tunnels. 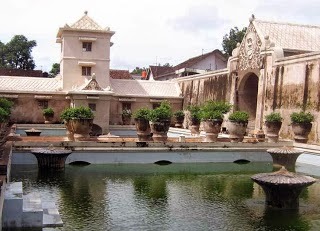 Taman Sari was once a beautiful and sophisticated water-park that long time years ago was also called as ‘Segaran’ which is in the Javanese word means artificial sea. 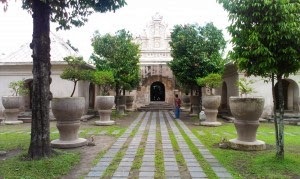 There are several elements that influence the architecture of the buildings is Taman Sari complex, including the influence of Hindu and Buddhist, Javanese and Islamic, Chinese, Portuguese and European style, can be seen from some parts of the building. Wall paint used is natural from brick pounded, mixed with limestone. Be beautiful classic color. 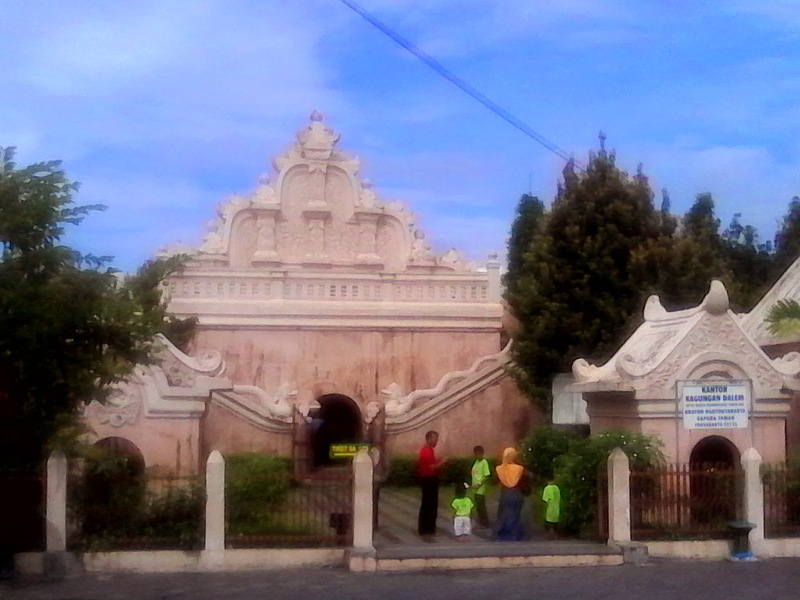 Taman Sari - Yogyakarta has two main gates, which is a Gapuro the Great (which contained western section) and Gapuro Stage (located on the East, which is currently used as the main entrance to the complex location of Taman Sari). The shape of the gates or 'Gapuro'nya is indeed very beautiful and original style of Java, on the details of this Gapuro is the original motive of Java such as stylized tendrils of plants, birds, tail and wings of an eagle. In Tamansari there is building called Gedong Sekawan. Gedong Sekawan it as a place to play or rest the daughters of the king and the king 's concubines in groups . Usually the princess will conduct its activities , such as painting nails , in gedong Sekawan it . To paint your nails , princesses will use kikit orange . Where the orange trees grow around the Sekawan gedong . Short growing citrus trees with small leaves , henna leaves much like wood that is used for nail polish . Citrus fruit , which is used to paint the nails , shape into small round red when ripe and green when young . The shape is very small. While kikit lime leaves , can be used as a cough medicine . In addition there are citrus trees that grow around gedong kikit Gang , there is also growing trees such thing Kepel . Where there dibatang fruit - tree trunks , much like the sapodilla fruit , both magnitude and color. Bear fruit only once a year . Kepel fruit is usually eaten by the daughters of the king , as an odor remover and facilitate menstruation . While pregnant women are forbidden to eat the fruit Kepel , because it can cause miscarriage . While leaves can Kepel fruit as a remedy for go out . 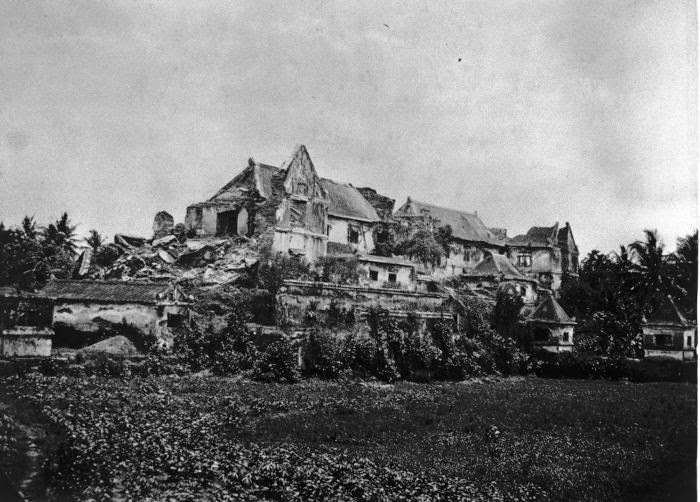 COLLECTIE TROPENMUSEUM Ruïne van een waterkasteel Taman Sari te Djokjakarta. Tamansari watercastle. At Bali Island, also there is water palace called : TIRTA GANGGA. Click TIRTA GANGGA - BALI and found the fact that both Java and Bali have so many heritage building that you might interest to see. I really appreciate you as a guest of Yogyakarta, so if you agree to use our services in terms of transportation while in Yogyakarta, we do not require you to pay a deposit (down payment) as a sign confirmed. I quite believe with your conform writing (deal) as you wrote in your email that sent to me. Anyway for any inquiries, please contact me soon by email to : aswoto69(at)gmail.com.